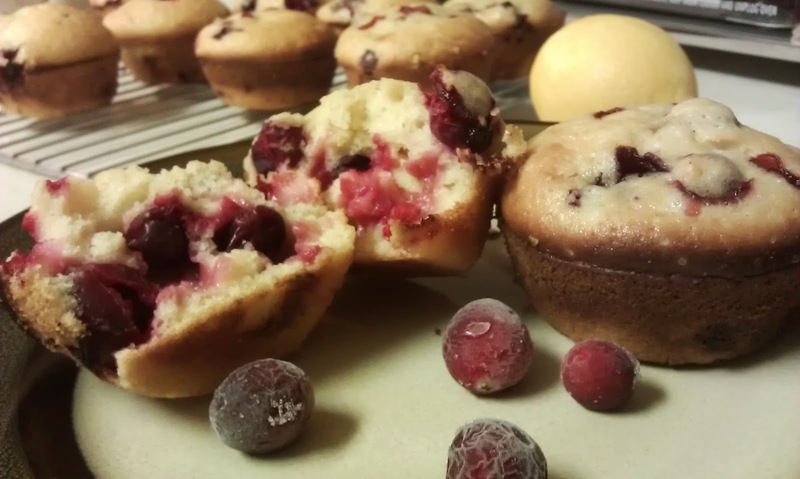 After I made my Lemon Cranberry Muffins for this month's Secret Recipe Club reveal, I started thinking they'd be good with lime, too. So I had to try it! Line muffin tin with paper liners or grease with cooking spray. In a large bowl, beat together yogurt, sugar, and eggs. Then add lime zest, lime juice, and vanilla extract. Lastly, stir in oil. Stir together flour, baking powder and salt. Gently fold into wet ingredients and stir until just moistened. Batter will be lumpy. Add cranberries and coconut and stir until combined. Preheat the oven to 350°. 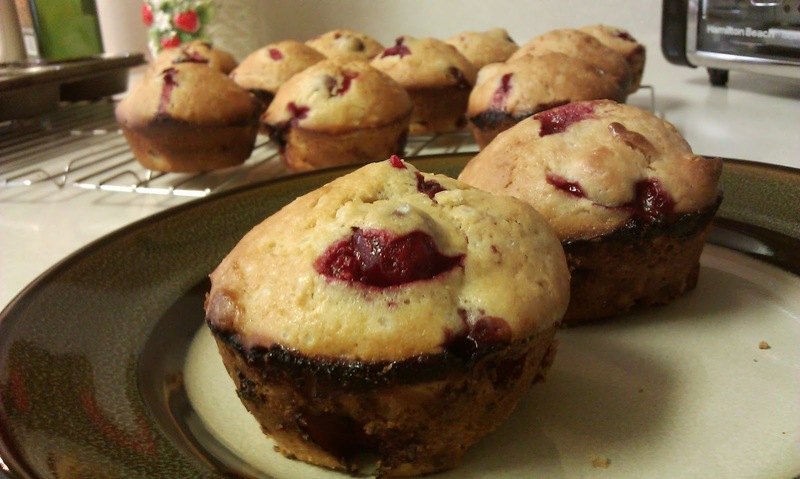 Spoon batter into prepared muffin cups and sprinkle tops lightly with coarse sea salt. Bake for 25-30 minutes or until lightly browned and a toothpick inserted into the center comes out clean. Yep, cranberry and lime are awesome together. I also love the addition of the coconut, which was a last minute thought. It adds just a touch of chewiness that I think is perfect. 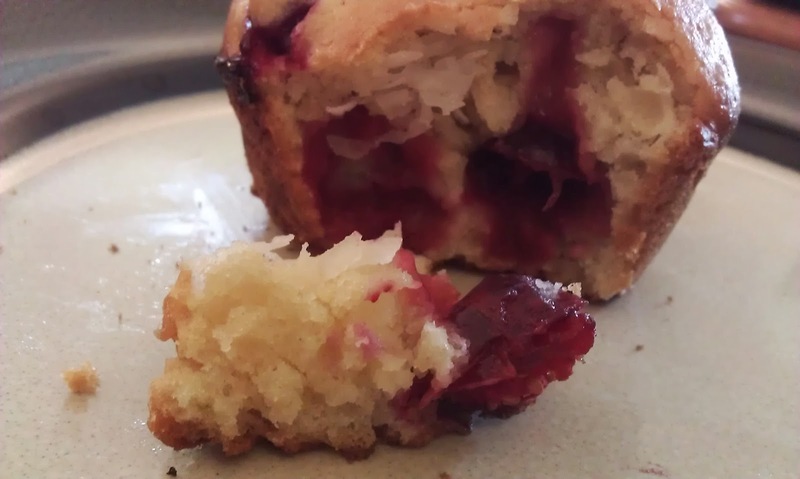 I also love how the whole cranberries pop and explode in these muffins as they bake, leaving little pockets of cranberry goodness. It's time again for Secret Recipe Club (Secret Recipe Club) reveal! This month I got to choose from Sarah's blog The Pajama Chef. Sarah lives in Indiana with her husband Ben (they just recently celebrated their 4th anniversary) and two kitties. She loves reading, getting good deals, peanut butter, and pajamas - as the name of her blog suggests. She'd wear pajamas all day every day if she could. Sarah has a lot of great looking recipes on her blog, making it very difficult to choose again this month. I started browsing Sarah's recipes, and I thought maybe these Mexican Hot Chocolate Breakfast Bars or these Peanut Butter Pretzel Granola Bars or these Apple Streusel Cheesecake Bars. This Crockpot Saucy Italian Chicken looks awesome, and I am definitely going to try Sarah's recipe for Cornmeal Pizza Dough - maybe this will, at last, be the perfect pizza crust. Sarah seems to think so. But, when I came across this recipe, I knew I'd found the one for SRC. 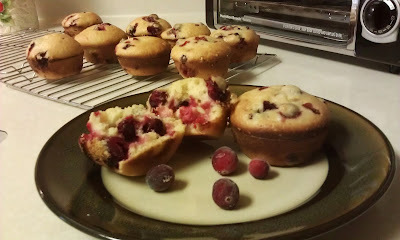 Two of my favorite flavors in one muffin! There was no way I could NOT make these muffins. juice from one lemon - about 3 T.
In a large bowl, beat together yogurt, sugar, and eggs. Then add lemon zest, lemon juice, and vanilla extract. Lastly, stir in oil. Stir together flour, baking powder and salt. Gently fold into wet ingredients and stir until just moistened. Batter will be lumpy. Add cranberries and stir until combined. Oh, Yum!! These are so good! Lots of cranberries in a lemony muffin. 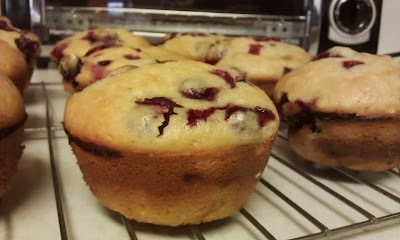 These just might be my new favorite muffin. 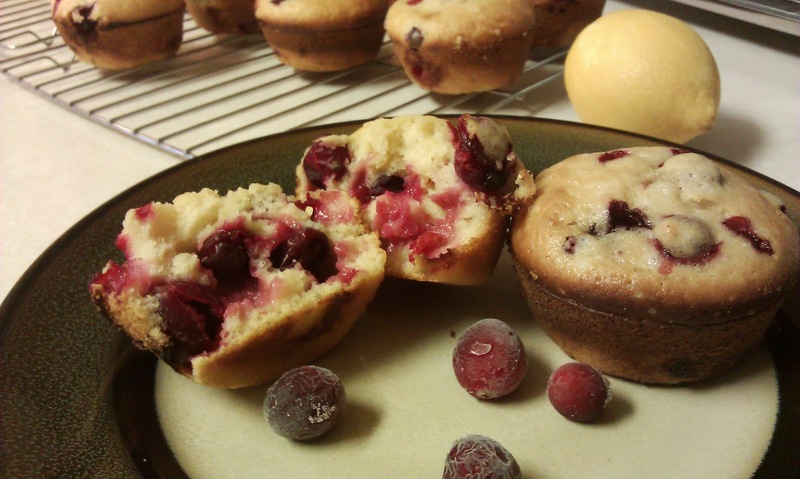 Sarah decreased the sugar in these muffins from 1 cup to 2/3 cup because she used vanilla yogurt. I used plain yogurt, because that's what I had, but chose to keep the sugar at 2/3 cup because I really like tart flavors. I also added the juice from my lemon for extra lemon flavor - and because I was having a hard time getting much lemon zest (Sarah's recipe calls for 1-1/2 T zest) I also decreased the oil from 1/2 cup to 1/3 cup and added a sprinkling of coarse sea salt to the tops of the muffins. I think it adds the perfect touch. Next, I'm trying these with lime instead of lemon - because lime and cranberry are awesome together, too.